A few weeks ago, I had late night coffee with my sister and her friends at The House of Robert Timms. We ordered a few desserts to go along with our coffee and one of them was Carrot Cake. A four-layer cake with thick cream cheese icing in between. 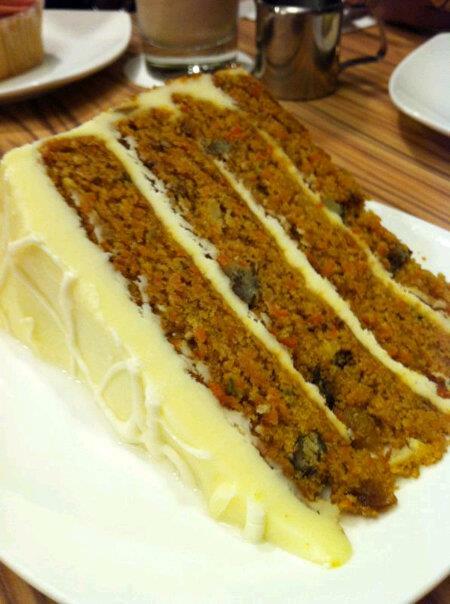 The carrot cake was heavenly and sinful. Besides the specks of carrot and walnuts, I spotted bits of pineapples in the cake! I knew I had to bake some myself after having the carrot cake at the House of Robert Timms. I think by now, you ought to know my love for easy-no-mixer-required recipes. I was glad I found this recipe from Joyofbaking.com. The recipe calls for grated apple and coconut which I omitted. Instead, I added crushed pineapples. Carrots and crushed pineapples helped in keeping the muffins moist. These Carrot Muffins tasted so good on its own. It would be perfect when topped with some cream cheese frosting! Next time I make these, I will definitely smear some cream cheese frosting. But first, let me find a good and simple cream cheese frosting recipe. Lay 15 paper cups in a baking tray. A - In a large bowl, whisk together, flour, sugar, salt, cinnamon powder and walnut. B - In another bowl, whisk together oil, eggs, crushed pineapples and vanilla extract. Using a spatula, fold B into A together with grated raw carrots till just moistened. Spoon mixture into the paper cups and then bake for about 25 - 30 mins or until a pick/skewer inserted comes out clean. Stand muffins for about 5 mins before turning out to cool on a wire tray. OVEN.....thats what i need. looks good.